Throwing techniques, known as “Nage Waza” are an integral part of Judo and Ju-jitsu technique. These are very handy for close contact self defense, and are a regular part of training at the Israeli Martial Arts Academy.Ashi Waza is a category of Nage Waza that refers to leg and foot techniques. 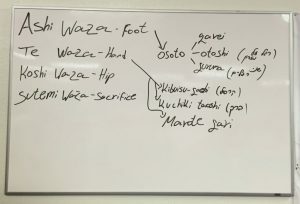 Ashi Waza includes Osotogari, Osoto otoshi and Osoto guruma (to name a few). Osotogari: Throwing your opponent off balance with a shoulder/head/neck push while stepping in and sweeping the opponents leg that is closest to you. This will result in a take down. Osoto otoshi: Similar to Osotogari, except that instead of completing a sweep with your leg, you hook your planted leg under your opponent’s leg instead. Osoto garuma: Similar to Osotogari, except that you widen the reach of your leg and sweep both of your opponent’s legs instead of just one. It is always important to practice these techniques and take-downs in a safe environment. You should always break your fall and tuck your chin by employing a strong Judo falling technique, known as a "Ukemi." Cupcakes time after class ;) thank you @montiel7322 for baking those delicious sweets for us. Thank you Y Not Grafix for the great artwork. Triangle choke workout at IMAA. Israeli Martial Arts Academy shared a post. Our school has the highest level of Israeli martial arts and self defense training in the communities of Westlake Village, Agoura Hills, Thousand Oaks, Oak Park, Calabasas, Malibu, Newbury Park, Moorpark, Simi Valley, Woodland Hills, Camarillo, Ventura, Oxnard and the Conejo Valley.